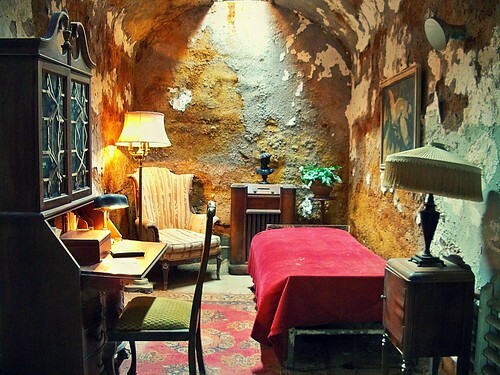 Al Capone’s cell at Eastern State Penitentiary, Philadelphia. Everyone knows that legendary gangster Al Capone’s reign ended when he was found guilty of tax evasion, but did you know that doing time for a minor charge helped the notorious prohibition-era crime boss lay low after he ordered the most spectacular gangland slaying in mob history? In 1929, on February 14th, seven members of Chicago’s North Side Irish gang were lined up in a warehouse/garage by two men from Capone’s South Side Italian gang dressed as police officers. Thinking that it was a routine police raid, everyone peacefully did as they were told as the rival gunmen removed their weapons and then proceeded to pump their bodies full of lead using two Tommy guns, a sawed-off shotgun, and a .45. Each of the seven victims received at least 15 bullets, mostly in the head. The event became known as The Saint Valentine’s Day Massacre. Shortly after The Massacre, during what is said to be a planned arrest, Capone is picked up in Philadelphia for carrying a concealed weapon, and sentenced to a year in Eastern State Penitentiary (ESP) where he could reside in safety behind bars in the “Park Avenue Block” of the prison. The warden and guards at ESP gave special consideration to Mr. Capone during his stay. He was permitted to hang artwork in his private cell, was allowed to have tables, lamps, a velvet duvet, comfortable chair and even an expensive radio so he could listen to waltzes after dinner. Capone was allowed to continue to conduct business. The organized crime boss was able to use the warden’s office to make long-distance phone calls and to meet with his lawyer. Capone was released from ESP two months early for good behavior! While Capone’s time at ESP many have been relatively pleasant, he may not have left unaffected by his stay. During the early years of the Twentieth Century, rumors about ghosts began to circulate at the prison. While he was incarcerated at ESP, Capone began to be “haunted” by the “ghost” of James Clark, one of the St. Valentine’s Day Massacre victims and the brother-in-law of his rival Bugs Moran. Other inmates reported that they could hear Capone yelling in his cell begging “Jimmy” to leave him alone. The crime boss even contacted a psychic to get rid of the angry specter. Years later, Capone would say that Clark’s vengeful spirit followed him from Eastern State Penitentiary and would follow him to the grave. Fact, fiction, imagination or was Capone starting to show signs of the full-blown psychosis that would eventually start to haunt him when he was later incarcerated in Alcatraz for tax evasion? Sure a lot more info in your blog than on the display board at ESP. Very interesting story, Cheri. How’d you get such a good photo of the interior? I had trouble getting the camera set for the whole room.